Steven Vaughn is currently pursuing a Doctorate of Musical Arts in Tuba Performance & Pedagogy at the University of Colorado-Boulder, studying with Professor Michael Dunn. He is the teaching assistant for the studio and also plays in the graduate brass quintet. He holds a Master of Music in Euphonium Performance at the University of Colorado-Boulder and a Bachelor of Music in Music Education and Euphonium Performance at Ithaca College, NY, studying under Dr. Aaron Tindall. Steve takes additional studies with Warren Deck at the University of Denver. 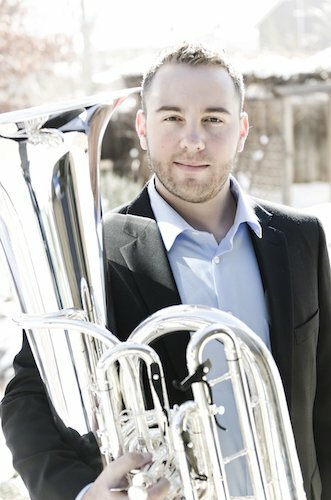 In the past several years, Steve has become equally at home performing and teaching on both tuba and euphonium. Recently he took first place in the Arapahoe Philharmonic Concerto Competition, appearing as a guest soloist with the orchestra playing Vladimir Cosma’s Euphonium Concerto. As a tubist, Steve is a freelancer throughout the Denver area having performed with the Denver Municipal Band, Longmont Symphony, Denver Pops Orchestra, Jefferson Symphony, and Fort Collins Symphony Orchestra. Other notable accomplishments include being a Semi-Finalist for the US Army Ceremonial Band Euphonium Audition and performing Holst’s The Planets with the National Repertory Orchestra in Breckenridge, CO. An avid supporter and enthusiast of British-style brass bands, Steve holds the position of Solo Euphonium with Denver’s premier brass band, Rocky Mountain Brassworks. Steve is an active teacher in the marching arts throughout the United States. As a performer he marched with the Phantom Regiment Drum & Bugle Corps of Rockford, IL from 2009 to 2011 and was soloist and section leader his last summer. Originally from Endicott, NY he taught numerous high school groups in upstate New York before moving to Colorado. Currently, Steve serves as tuba/brass instructor for the Phantom Regiment Drum & Bugle Corps and prior to that he taught brass with the Reading Buccaneers Drum & Bugle Corps in Reading, PA. Steve teaches and designs for multiple bands in Colorado, serving as Visual Caption Head for Monarch High School in Louisville, CO and Visual Designer for Gateway High School in Aurora, CO.